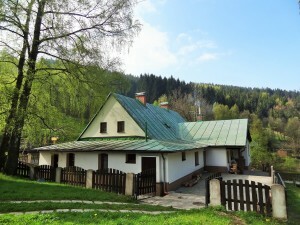 Cottage Grey Wolf offers a pleasant year-round accommodation in the ski and bike resort Destne in Orlicke Mountains. The cottage is located a few meters from the ski slope and is an ideal place for winter and summer holidays, for family celebrations, corporate events, etc. Affordably priced accommodation is available in five-bedded, four-bedded and two-bedded apartments (with a total capacity of up to 33 people) equipped with kitchen, refrigerator, jug kettle, private bathroom and a WiFi connection. Lounge offers a pleasant seating area beside the fireplace. You can find there also a central kitchen equipped with a stove, hot-air and microwave oven, dishwasher, kitchen utensils and dishes. For beer lovers, it is possible to rent a beer tap. Outside is available an outdoor terrace with barbecue, fireplace and a grassy playground. A private parking and a special room for bikes and skis storage is also available. The cottage is located nearby the ski-center Destne (45 km of maintained trails for cross country skiing and 11 ski lifts for downhill skiing), the nearest ski lift is situated about 100 meters from the cottage. From spring to autumn hikers and cyclists can enjoy 45 km of cycle-tourist trails. We will be happy to arrange catering for you, if you are interested.